I made a few select holiday sweets this year, which I have not posted about until now because they were given as gifts and I wanted to keep it all a bit hush hush. However, I am so proud of them that I shall share them with all of you lucky folks now, just in time for the New Year so that you can begin planning for next year. Hahaha! I will tease your imagination and senses by first showing you a picture of the most fun kitchen implement – the syringe! 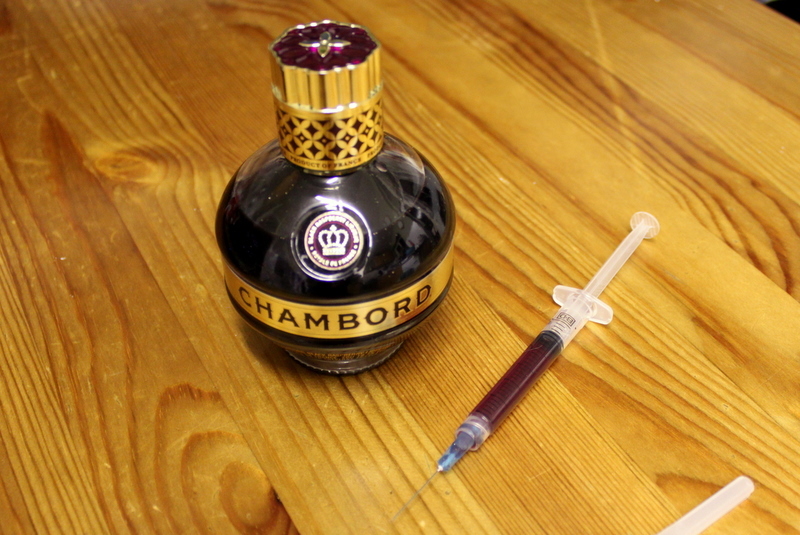 I used it to (attempt) to fill some of my chocolate-raspberry truffles with Chambord. 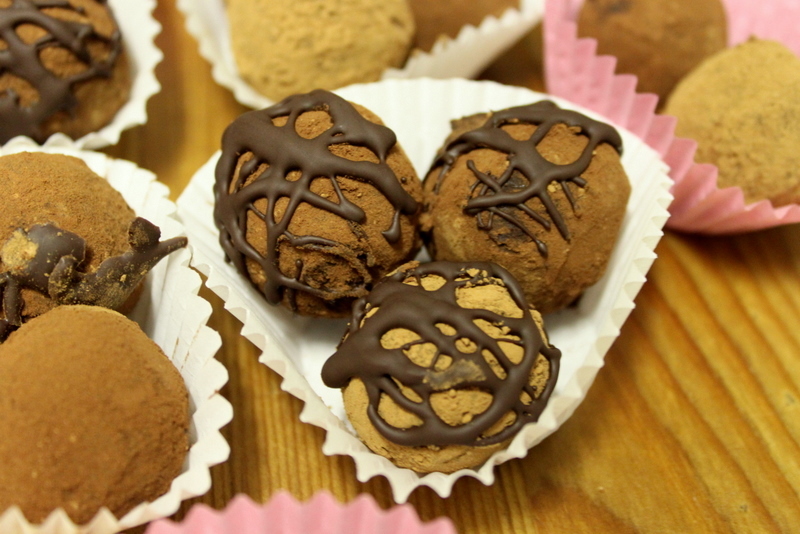 It worked okay, but it would work better if I planned ahead and left a tiny space in the centre of the truffles, in order to increase the booze to truffle ratio! I did not take any pictures during the ‘making of’ process, but it was easier than I expected for my first try. I can post the method if anyone likes (which reminds me, I have to send a pie recipe from an earlier post to a friend still… damn my awful memory… but yay for actually remembering now – better late than never). 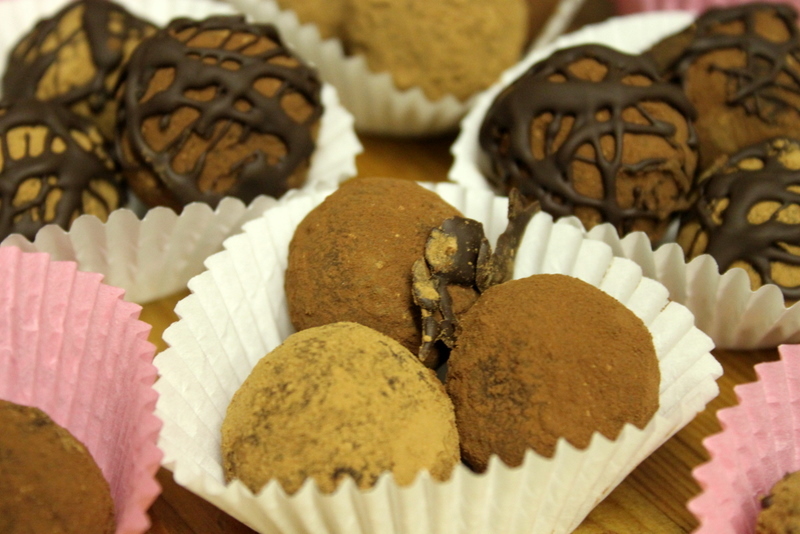 All of the truffles I made were the same delicious flavour (chocolate-raspberry), but I had plain coated ones (dark or semi-sweet cocoa), chocolate drizzle ones, and extra boozy ones (in the pink papers, to distinguish). They were MEGA-chocolatey, so I am glad that I made them relatively small (three of them fit comfortably into a fairy-cake paper). The chocolate hardened nicely, but I think next time I would try tempering it to get a nice shiny gloss, like the pros do, you know? I also made shortbread. 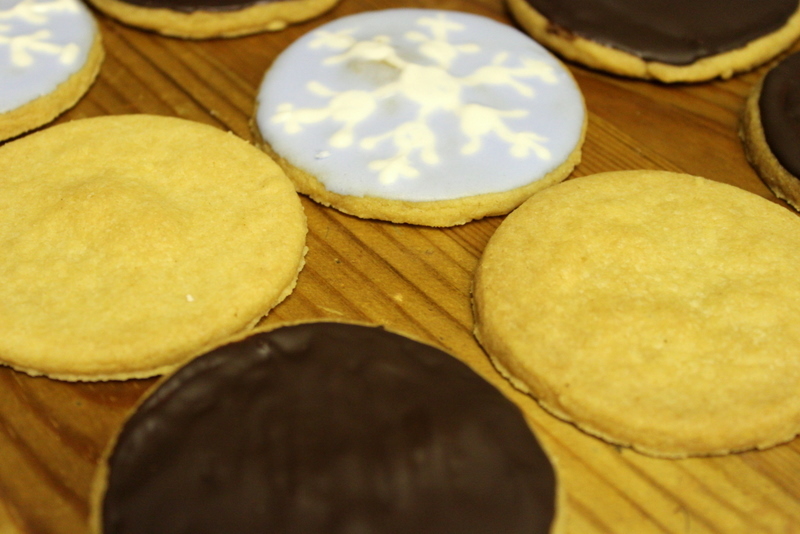 Shortbread is like the simplest cookie ever, but I had real difficulties being confident in mine. I guess when a recipe has less ingredients (three in this case) it is even more important to get everything just so, in order not to screw it up. I made mine a little thin, which didn’t bother the taste any, but the texture was better for tea-dunking than just nomming. 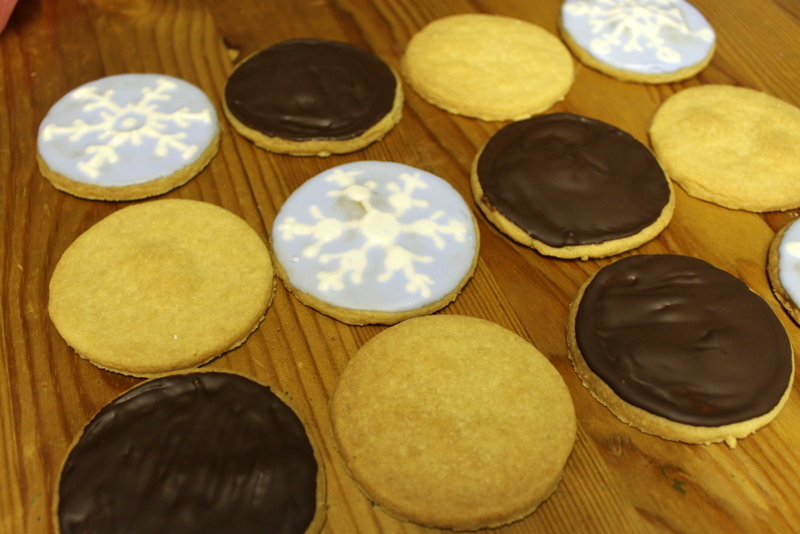 I decided to mix up the gift biscuits by making some chocolate coated ones and some royal iced ones (with little snowflakes, ooo). This one here is a close-up of my mad skills. Although that was not perhaps the best snowflake I accomplished, I swear! Next is a picture of the already seen gingerdead men. I used a cookie cutter and then a stamp on the reverse to push in the skeleton design. 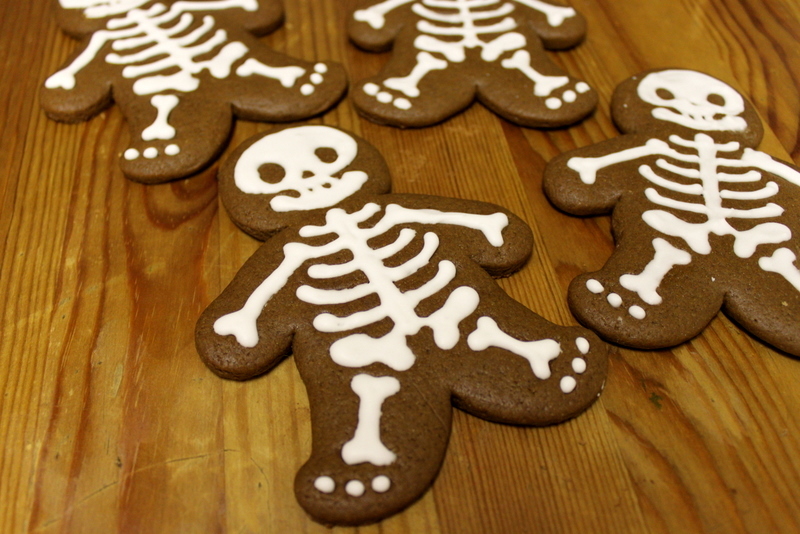 I then used royal icing to pipe their little bones, which was harder than I expected, but made easier by my slightly gloopy royal icing texture. 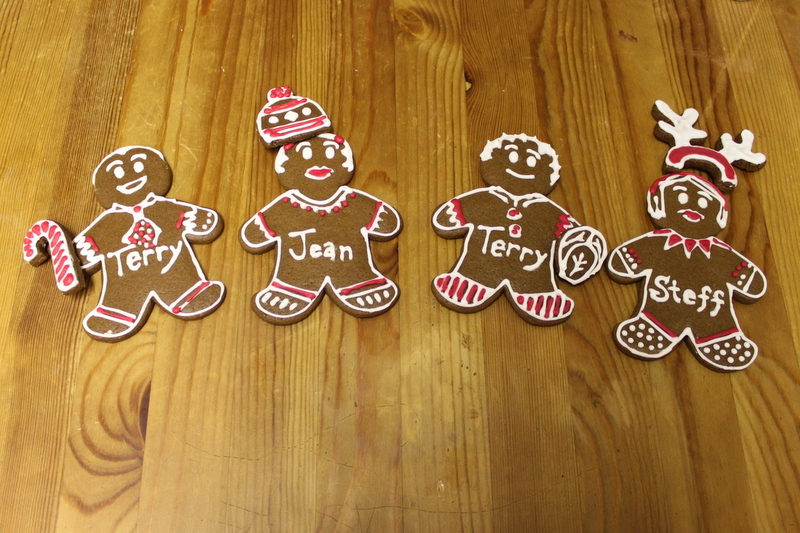 I also made little personalised (roughly) gingerbread men (or people, if you are über PC) for some now extended family members of mine (I am not sure what the right terms are, as I don’t think you use aunt/uncle/cousin-in-law). I even made some little Christmas accessories, like hats or baubles! The first batch went to the various Boageys/Thompsons. The second batch went to the (other) Atkins! And the next holiday meal is tonight, for New Year’s Eve (I like that I just though of all the above treats as a meal, hahaha). We shall be having Greek – various mixed vegetable skewers, chicken and prawn marinated skewers, potatoes, haloumi, and salad. Sadly, I did not make any desserts, but we have loooads of chocolates and biscuits in the house, so I figured they’d do (although no more of the above pictured sweets, as we have already finished all of the ‘testers’ and ‘extras’.